The author is a native of Sorsogon (the former town), now a district when it joined Bacon to form the Sorsogon City. He still comes to visit his hometown, meet with friends and family, visit places he grew up with, try the latest restos in town and other activities that remind him of his childhood. He’s also happily married to a fellow Sorsoguena, who is a former classmate as well. Thus, deciding where to go during Holy Week and Holiday Season is quite easy. His love of writing goes back to his Luzon Tip days in Sorsogon National High School under the tutelage of Mrs. Rosani Palma and Ms. Domigiano. Even during college and start of his professional career, he still kept a personal journal. In the last geveral years, he became interested on Web 2.0 tools like Wikipedia and Blogger. This is where it all started, editing the Wiki of Sorsogon City and Sorsogon Province, and researching the history of the province. This is where the blog for Sorsogon City started. How come Bulan have a better resolution satellite image than Sorsogon? If you look at Google Earth or Google Map, Bulan have a high satellite image resolution. A couple of months back, I noticed that the area along the Sts. Peter and Paul subdivision as updated in the Google Map. I am still waiting for Google to update the section in Brgy. Pangpang/Macabog and Brgy. Balogo. Based on what I gathered, the update on the map is based on how many hits the section has. The higher, the sooner Google will update it. Btw, where can one buy a topo map of Sorsogon? have you tried the DENR office if they have topo map of Sorsogon? NAMRIA, which updates and print maps is an attached agency of DENR. There are 1:50,000 scale amps for sure and even 1:250.000 but it would be best if you could get 1:10,000. Also be sure of what quadrangle you are interested in so you will know what to buy. The area you might be interested in may not have the same name as the quadrangle where it is located. I did consider the 1:50k scale NAMRIA map a couple of years ago, but it’s just too expensive – PHP 5k/block. And I think I need 3 or 4 blocks for the city alone and its nearby areas. But then, I inquired on a map store somewhere in Avenida. Would you know where these maps are available (I am not sure if the store is still open) and for how much? I love to get hold of this, as long as it’s affordable. I remember a very old topo map photocopied from UPLB library by one of my friends and shows Brgy. Bibincahan still deserted but already reflected the Gate 3 extension (now part of the diversion road). 5K per block?!! that’s way too expensive for a topo map that you can buy from Bureau of Lands (?) for about 250. maybe what you are referring to is the digital version that contains GIS files. these are not scanned images but files that can only be opened using GIS sofwares. please try enquiring from Bureau of Lands, they might still have some. cheers! I got the price from a cartographic store along Avenida. Thanks, I will try BoL. 5k/block? are you sure? did you inquire personally to NAMRIA? As far as I know, Google updates each section of the Google Map with high-res map. HOwever, there’s no clear documentation saying which place will be the next to be updated. I guess, Bulan is just lucky to get the latest update. 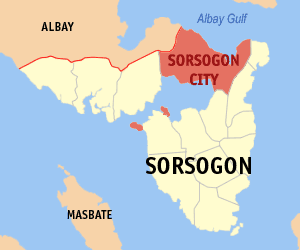 Furthermore, Sorsogon City is way bigger than 20 years ago so the probability of having an updated hi-res map is lower than the other Sorsogon towns. As of the moment, I am still waiting for that update. Hi Sir! I’m a Sorsoganon whose currently living in Manila for my College education. Having to read your posts always makes me feel at home… It’s been a quite a long time since I left Sorsogon and am hoping to be back soon… I Hope to read more of your wonderful posts! Thanks. It’s nice to know that the articles remind Sorsoganons who are far away from home. Thanks for getting my articles and posting it here in our account… God bless.. There’s another one article .. see it at our PIA website, the Feature story :Army’s Tarabangan sa Brgy Pandan, a convergence initiative to fight poverty… its a news about the collaborative assistance given by the Philippine Army and the local officials here in Sorsogon..
Let me check again, I think I saw several stories about Brgy. Pandan, but I never posted all of them. I already re-published your article. Thank you for the news. Nowadays I could hardly hear news over the radio. We got cable tv but there weren’t substantial news coming from sorsogon province. This website addresses my longing for news from our province. More power and Godbless! Thanks for the posts! I could hardly listen to the radio nowadays. Your posts keep me updated. Keep up the good job! More power and Godbless! Hi Good Day ! Im very proud to say that im a Sorsoganon. Last October I am very glad that I was able to witness some of the Kasangayahan Festival activities for the first time and I can say that Sorsogon has a lots to offer when it comes to its tourism industry. If you can posts more on the tourism project of the province that would help to attracts more tourists in our province. I have just recently subscribed and follows your posts via facebook and Im very happy that i have read your post about our beloved province Sorsogon it keeps me updated about our province. Thank you very much for doing such a great work, more power and keep it up! Yes, it’s really the site’s objectives to market Sorsogon’s tourist spots. Unfortunately, the site owner is based in Manila and can only develop new articles when he visits the place. Greetings! I find this site so facinating. My maternal side is Bicolano, specifically from Camarines Sur. I wonder if you have any historical information on that region, or may know of anyone who write blogs about there. Thank you again for the wonderful histories. If you check in National Bookstore, there are several books on the history of Bicol region. Specially Camarines Sur, which is the center of Catholicism then; where the priests are, you normally find better historical documentation. Let me check my previous articles, but yes, I found more than a couple. Good that i found your site….Great site..lalo na sa aton na mga Sorsoganon. hi Manny, kumusta na? Awat na kita wara iristoryahan. Mayad ini na site ni Sorsogoncity. You may want to get in touch with Manny via FB. He’s pretty active. Hello sir, me and my brother is planning to climb Mt. Pulog in Bacon this coming holyweek. Baka gusto nyo pong i-post dito sa site n’yo sa mga gustong sumama. Mas marami, mas masaya ika nga. I’m not a mountaineer but I really love to explore my homeplace every time I got a chance for vacation. At baka meron ding makabasa na familiar sa place at makapagbigay ng tips. If you can provide me additional information – date, assembly time, overnight or day hike, and related details – definitely, I can post it for everyone’s reference. By the way, I need your contact information as well or I can course it through mine if you are afraid that your email address be mis-used. Or if you are comfy, just send me your full name and mobile no. I will send you the draft, once I get the info, and let you approve it. Ok tnx Sir. May nabasa kasi ako from a mountaineering group na sa Sta. Cruz Bacon ang drop-off point nila, pero meron ring isang reader na nagsabing may ibang way sa may Gate 3 sa Bibincahan village at mas malapit daw. I will get in touch with you when I get there and when we finalized the plan. Garo naawat ka na nakabisita sato. Before the diversion was completed, Gate 3 was the jumping point to the Pocdol Mountains, however, this is a long walk compared to Sta. Cruz. My friend and I tried going to the lake via Gate 3, it took us more than an hour just to get to the foot of the mountain. Then coming down to this last sitio of Bibincahan, bordering Bacon, took us 1 hour. We never reached the lake because we actually got lost and realized it only just before dark. You can try checking the Google Map though for some ideas. I can’t remember if Sta. Cruz is the barangay hosting the beach, Libanon. If so, I know some of my friends came down from the mountains on that area. Another friend took a boat ride before climbing the mountain and came down on the side of PNOC area (that I really want to try!). Another exit is Brgy. Guinlajon or Macabog. Anyways, keep me posted if you need the site for information disemination. You can try this URL – http://www.mountain-forecast.com/peaks/Pocdol-Mountains. It has a small topo map. Thanks for the info. Yearly man po ako naka-uli kaya lang hanggang sentro lang 😦 . Hadlok man kaya magsolo sa mga remote areas. When I was a kid, me and my brothers used to climb Mt. Lubong, part of Pucdol mountains via bgy. macabog. Good luck on your endeavor! I hope you can share your experience to the SC readers. Thanks for the feedback. If you have stories to share about Sorsogon, or some pictures about the city, feel free. You can just send me an email – sorsogon@live.com. your blog is interesting. it’s great to know that finally, a sorsoganon proudly writes about his hometown. 🙂 a kababayan. a schoolmate. same mentors. nice. nice. Good question! Honestly, I don’t know. Let’s check if somebody from the readers will reply back. as far as i know, we bicolanos always pronounce the g as in ‘gee’ (gatas or gibo) instead of the ‘ha’ in j, otherwise if it is pronounced using ‘ha’ then word should start in “J” or even better “H”. As for the I or E-i presume the letter I is pronounced as ‘ee’ instead of ‘eye’. hope it helps. Thanks! Let’s compare it with how Gimagaan and Girawan in Donsol, Ginablan in Pilar, Genablan in Matnog, Ginangra in Magallanes and Gimaloto in Sorsogon City are pronounced. I was wondering how I can contact Dr Nap Arevalo? I’m a former student in AMEC-BCCM. Sorry, but I don’t have any contacts with AMEC. If they have have a website, that’s the first thing you might want to visit. Hello Lorelie, Dr Noli Arevalo is a very good friend of mine and is my neighbor as he lives here in St. Raphael Subdivision, Pangpang, Sorsogon City. puede mag post nin “tiglis ko…” is that the right word? Basi tabi ‘tinigsik ko…’ an gusto mo sabihon? An tigsik o kansíng sa Daan na Bikol saróng suanoy na porma nin halìpot na rawitdawit na minapahilíng kan natural na talento kan mga Bikolano sa pagberso. Kompwesto iní nin duwá o abót apát na taytáy na igwáng walóng silaba o sobra pa. Lambáng sarô kainí igwáng eskimang saróng sarambít o mono-rhyme. Pabiglâ na tinitìyaw o inginungusò iní sa atubangan nin pagtiripon. Iní haros makangingirít, o igwáng “piltik” sa siisáy man na pinapatamáan. Nahihimò na “sarambít” o arangay sa paririkasan na pagkawingkawíng kun mahusay an paratigsík. If you have time, please see attached copy of my Reply in the Ombudsman against those involved in the P350 m LBP Loan. It is now elevated to Plunder. Hope you could use this as a filler in your future research. Thanks. 2.4	Even granting without admitting that Annex “5” of the Joint Counter-Affidavit of Messrs. Manzanades and Eje was submitted, the allegations in paragraph 4.5 that all charges shall be waived according to Annex “4” are NOT CORRECT. Review of Annexes “4” of the Joint Counter-Affidavit reveal the truth. 2.7	Respondent Manzanades offer of 5.061% has become an illusion. It is no longer found in any of the two LBP Loan Agreements (marked in the Annexes “14” and “15” of the Joint Counter-Affidavit of Messrs. Manzanades and Eje) both signed by Respondent Governor Lee and Respondent LBP Vice President Renato G. Eje. 4. Indeed, with the admission of the truth that the PNB proposal of five percent (5%) is most advantageous than 5.061% of LBP but was never acted upon by the Provincial Government and by the Respondents, the evidence of guilt of respondents are strong enough to warrant immediate preventive suspension from the office. 6. Worst, based on the Letter dated June 1, 2012 (marked as Annex “V” in my Complaint) of Provincial Treasurer Efilda C. Nogales and Provincial Accountant Mercedes J. Ativo duly noted by Respondent Gov. Lee, the Provincial Government had ALREADY PAID an amount of SEVENTY TWO MILLION NINE HUNDRED TWENTY FIVE THOUSAND NINE HUNDRED FORTY EIGHT PESOS AND SIXTY ONE CENTAVOS (P72,925, 948.61) to various contractors. Sir, add ko tabi kamo sa blogroll ko ha? Okay lang? Good day sir! I’m a history major from De La Salle University po. I am currently researching on the governors, congressmen/representatives of Sorsogon from the early American period up to the present (2016) and I hope to make a comprehensive list on this. It is for my internship as a research assistant for my professor who is a native of Sorsogon. May I ask for some recommendations (credible sources, information) to which I can gather and accomplish this? Thank you for your consideration. Have u checked the blog, I have a few list. I think it’s only until late 60s (the list came from a historical research of Sorsogon during the late Gov. Frivaldo’s time). I do know that after him Gov. Lee (and his son, Bobbet Lee, starting July) and the late Gov. Arnedo became governors of the province. However, I don’t have the exact period, neither I plan to do research about them. Because of your message, I am forced (encouraged) to publish my researched articles on a couple of Sorsogon governors. By the way, you can look for the book – A History of the Bikol Region by Jaime T. Malanyaon – it should help you on the history of Sorsogon. For the Congressmen, I suggest you research at the House of Congress.